Learn about us, The Brisbane Spine Clinic, and our difference! 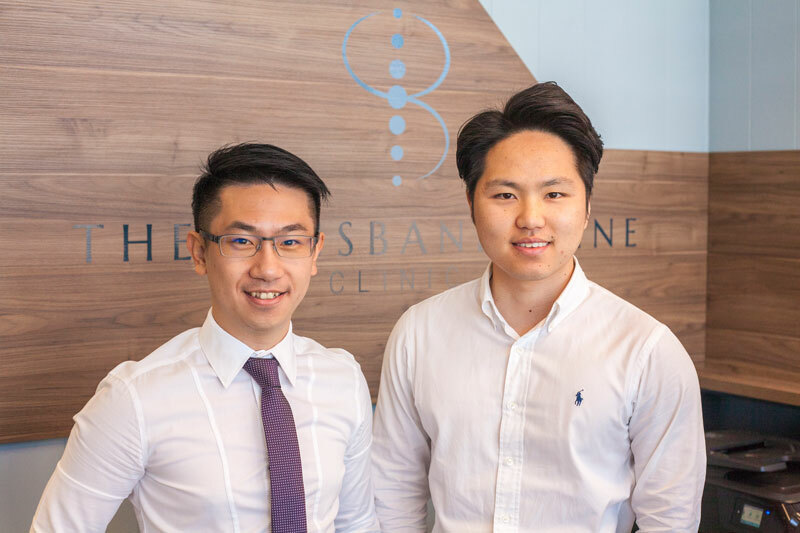 When co-founders, Mr Yu-Tsung (Justin) Lin and Mr Sang Bin (Leo) HYUN opened The Brisbane Spine Clinic, they did so with a vision to create a specialised spinal clinic providing excellence in spinal care to the community of Brisbane. From the moment you book in for your consultation till the completion of your spinal treatments, you will realise The Brisbane Spine Clinic difference. A difference that provides peace of mind – an alternative to spinal surgery or invasive spinal treatment techniques. A sense of trust – we use our clinical expertise to explore all underlying causes related to your pain-points for the purposes of a thorough prognosis and holistic treatment solution. Understanding and clear communication – we are fluent in English, Mandarin Chinese, Korean and Cantonese, mitigating the challenges of language barriers. Dedication and commitment – we will work with you along your journey till we reach a pain-free outcome. You, our clients, are the reason we exist and we exist to offer you the health-outcomes you deserve! We are here to provide the highest level of care possible for all of our clients. We help patients suffering from ongoing chronic spinal conditions that have had no results with traditional average healthcare alternatives. We understand how debilitating it can be to live with ongoing spine condition, we understand your desperation – we are here to help you. We apply the latest and the best in clinical outcomes for spinal health to help all our valued clients live life to the maximum and ensure they are always in their prime. We believe there is a different solution. A solution that does not rely on medication, injections or surgery. We believe by working with you, our clients, we can make a difference to achieve long-term robust results together. We commit ourselves to constantly improve our skills, service, and convenience for all our valued clients. Our philosophy is reflected in our care model, where we are not here just to provide a quick temporary patch-up. We aim to use problem-solving, results based, goal focused clinical approach, to get to the root of your condition and achievable measurable improvements. We believe in supporting and providing care for our patients through a lifetime. We are here, every time, anytime. The Brisbane Spine Clinic have Spinal Consultants. What is a Spinal Consultant? At The Brisbane Spine Clinic, our Spine Consultants have dedicated their careers in the field of musculoskeletal manual therapy with a specific interest in the treatment of chronic neck and low back pain. They have done extensive study in this field, coupled with years of hands on experience, our Spine Consultants are able to bring you an advanced level of information and treatment options to manage and treat your spinal condition. What sort of treatments does the Brisbane Spine Clinic offer? At The Brisbane Spine Clinic, we believe in a holistic approach to treating your spinal condition, meaning, we examine the entire body to understand the cause of the condition, rather than just treating the pain itself. There is no single treatment plan, but rather, we tailor a treatment plan to take into account your lifestyle, goals, general health, and the current state of your condition. Our Spine Consultant, Mr Justin Lin, has also trained in Mulligan Concept techniques, a pain-free, instant result manual therapy that is very effective in the treatment of spinal conditions. How do we differ from Orthopaedic Surgeons, Neurosurgeons and general Physiotherapists? Here at The Brisbane Spine Clinic, we are dedicated to restoring your ability to move and function without limitations through prehabilitation or rehabilitation. We apply our expertise in anatomy and physiology coupled with an outcomes-based care model to diagnose, manage and treat spinal or other movement disorders. Using evidence-based clinical health science, we are able to provide (in most cases), treatment for chronic lower back pain and chronic neck pain, preventing the need for spinal surgery and invasive spinal treatment techniques. We treat conditions without the need for invasive techniques or surgery which is the job of other specialist disciplines. Nor do we just focus on neck and spinal manipulations, instead we provide a holistic treatment plan focusing on symptomatic areas and the root causes of the pain. I've been told I need Spinal Surgery, how can you help me? At The Brisbane Spine Clinic, we believe spinal surgery should be the last resort. We offer our Spinal Special Consult service, an advanced examination of your condition to understand the underlying cause, rather than just a tunnel visioned approach to treating the just the symptomatic area. We will be able to give you a second opinion on your spinal surgery and in most cases, offer a noninvasive alternative treatment option. We understand how daunting the thought of spinal surgery may be, which is why we are committed to a problem-solving, results based, goal focused clinical approach, to get to the root of your condition and achievable measurable improvements for life long results. Book an appointment with a Spinal Consultant today!